EDDM® Postcards is rated 4.4 out of 5 by 10. PrintPlace.com offers a variety of printing options that fall into EDDM® approved sizes. "Every Door Direct Mail was a fantastic way to reach local clientele in a very cost-effective manner….I was very pleased to find that PrintPlace.com had templates specifically designed for EDDM®..."
Rated 5 out of 5 by Damion22 from Excellent!!! I'm extremely happy about the quality and please how quickly they arrived. Rated 5 out of 5 by Bucki from Very professional! The postcards and service were professional. I will be ordering more! Rated 5 out of 5 by Rob27 from Best Price and Did not skimp on the quality! I ordered the EDDM postcards and they were 2nd to none. Quality was as good as it gets and you can't beat the price. Rated 5 out of 5 by Anonymous from Great Design Tool! I needed to design an EDDM mailer and really didn't know where to start. So I went to the PrintPlace web site and found their brochure design feature. The cool thing is that the design tool had all of the US Postal Service EDDM acceptable sizes and all the information on the proper size and placement of indicia. I ordered 5,000 12"x6" brochures on 14pt card stock with four color processing with a high-gloss finish on both sides for under $800 bucks!! Best of all, they had the order complete in only 3 days from the time I pressed the submit button. Pain free process.... Worth every penny! Every Door Direct Mail (or EDDM®) saves you money on postage while targeting more addresses than traditional direct mail. Since postage costs around $.175 per piece, you get to spend less (compared to traditional postcard mailing) while spreading the word about your business. All of our EDDM® postcard sizes are covered under the USPS Every Door Direct Mail® rates. Be sure to avoid rounded corners, and avoid using a gloss or UV finish on your postcard’s mailing panels though. Once you receive it, you'll just need to bundle it for mailing, fill out the required USPS paperwork, and take it to the post office. Same Day Turnaround: Every Door Direct Mail® printing is even available the same day your order it. Not wat you're looking for? Check out all our postcard printing services. Download an EDDM® guide. It’s a helpful reference guide that will help you understand how to take advantage of the program. You can save money by using EDDM®, but you must follow the process that USPS has outlined, or your postcard may not qualify for these low postage rates. As you design your EDDM® postcard, we highly recommend using our layout templates, so you can fit your direct mail piece to the USPS design requirements. Our layout templates also ensure that your postcards meet our printing guidelines with bleed lines and a blank space for ink jetting an address. You can download the right layout template in an EPS, PDF, or JPG format. EDDM® in a nutshell: You select a target area on USPS.com and the U.S. Postal Service will send your postcards to every address in that neighborhood. That’s how they are able to offer such low postage rates. USPS has very specific rules for EDDM®, so read them closely before you design your piece. Before you get started, give us a call. We'll be happy to lead you through the process, print your job according to the USPS specifications for EDDM®, and ship it to you. The USPS has specific guidelines that you must follow for Every Door Direct Mail® printing, bundling, and mailing. You may visit USPS.com to read the EDDM® instructions carefully and place your order accordingly. Use the USPS tools to figure out which carrier routes you want to target, and order the appropriate number of postcards. Keep in mind that USPS has a 5000 per day limit on EDDM® mailers. 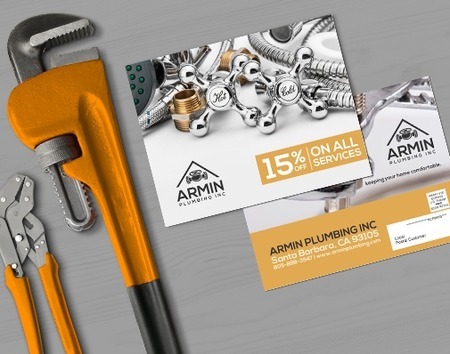 EDDM® postcards can be powerful tools to tell everyone in specific target areas about your business. The most popular uses are: automotive direct mail, grand openings, sales events, holiday specials, neighborhood restaurant take-out menus, coupons, and more. The most effective direct mail advertising reaches each customer several times, so schedule a multi-touch direct mailing campaign, giving your customers advance notice of an upcoming event and a reminder right before the event. To learn more about direct mail marketing or creating and running your EDDM® campaigns, here are a few resources..